Social media marketing has never been a strong point for car dealerships, and there are several factors and reasons as to why that is. Some are of no fault of the dealerships’, but the way the automotive industry has operated when it comes to marketing over the decades. Despite dealerships’ dependency on corporate advertising, television, radio and newspaper ads, there’s no excuse as to why a small locally owned car dealership, or multi million dollar franchise can’t see results from social media. Let’s take a look at a few mistakes dealers make annually, and how we can fix these issues in 2017. Lack of engagement stems from a number of variables. Poor content, inconsistent posting, failed advertising campaigns, and no creativity are at the roots of little to no engagement. Dealerships approach Facebook as an immediate “get car sales quick” or “grow large following” platform without actually doing any work to build that following and customer base. They’ll start out posting irrelevant and boring content which will usually last a few weeks, and when they receive no engagement, they quit. In some cases, there are dealerships who have their own employees comment, share, and like posts to generate reach and appear more popular than they really are. It’s no surprise that it doesn’t work, and in culmination with non-native content, there’s no value being given to already existing followers on that Facebook page. Lack of digital media content, which is something I’ll get into later, is at the very core of no engagement. Dealerships’ Facebook pages become barren, with inconsistent posting as a result. Eventually the dealership will give a haphazard effort, making their page essentially invisible. Dealerships, like any business, will use Facebook ads to target customers, grow a following, and generate nonorganic reach. It’s not the advertisement itself where things goes wrong, it’s the target audience in conjunction with the content. 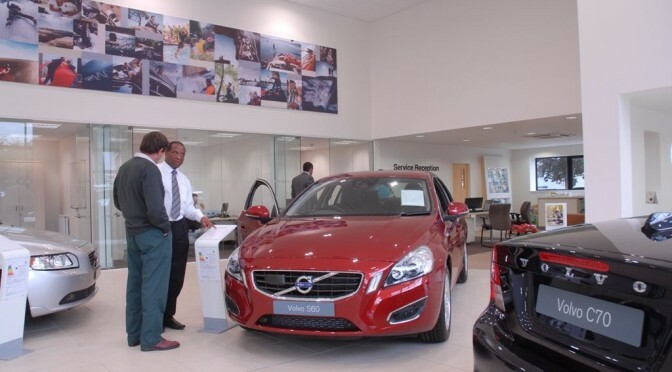 Rarely if ever, do dealerships create native digital content that includes pictures and videos. Without high quality pictures and videos, there’s no reason for people to focus their attention on your dealership. Ads with no value will be overlooked, and usually it’s the hard selling content that really gets ignored. Even for content that isn’t promoted and just shared throughout the day, posts that don’t resonate with the audience that you’ve built, or the customers who’ve followed your dealership will fall on deaf ears. 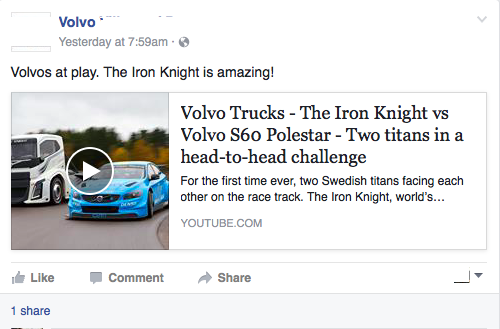 A local Volvo dealership shared a link to a video on two non street legal Volvos racing around a track in Sweden. I don’t proclaim to be a Volvo customer expert, but 99% of Volvo owners have no intention of racing their S60’s, nor would they care for a modified Volvo truck sold only in Europe, going up against a Volvo S60 race car. Know your target audience. Not just in terms of Facebook advertisement, but for content as well. This is related to lack of engagement, and this also leads us into the final reason why dealerships eventually quit on being committed to Facebook and social media marketing. Digital media is on the rise, and we can thank Instagram, Snapchat, and Pinterest for that. High quality pictures on social media wasn’t as prevalent three or four years ago. In 2017, it’s vital and it ties into why car dealerships fail at social media. If you look up and down dealerships’ timelines, you’ll notice a lack of eye catching, attention grabbing, interesting native content. There’s articles from Car & Driver, news sites reporting automotive news, and even YouTube videos that don’t help explain or persuade customers to buy the cars the dealership is selling. Most importantly these links take potential buyers away from your Facebook page and website, and now you’ve risked losing that traffic forever. Without digital media, you won’t see engagement. When your content is poor and irrelevant, it doesn’t resonate with your target audience. Now that we have a web to work with, your content is at the center of why you’re not seeing results and existing followers aren’t liking or sharing the content you’re promoting. When you bring these three factors together you end up with dealerships quitting social media marketing without putting 100% effort into it. Digital media that includes video, high quality pictures, and eye catching content that is relevant to your target audience will make your ad campaigns more effective. This leads to higher returns on investment and engagement rates. To stand out on Facebook or any social media platform, you need attention and eyes on your accounts. Without that attention your content is essentially invisible, which is why if you’re making these three mistakes, you too will quit on social media marketing.